The pizza I most often eat in Shanghai is Hello Pizza‘s. It’s not the best, but at only 10 rmb for a 9″ pepperoni or Hawaiian pizza, it can’t be beat. Thrifty pizza scarfer that I am, I’ve been a big fan of Hello Pizza ever since I moved to Shanghai. So the other night I ordered pizza for dinner. Imagine my horror, then, at being told that the pepperoni pizzas are now back to 15 rmb (!) and the Hawaiian pizzas are now 18 rmb (!!!). Noooo… (The price changes haven’t made it to the online menu yet, apparently.) I guess those ridiculously cheap prices were really just too good to last. Even with the recent price hike, the pizzas are not even remotely expensive. The only decent pizza place I know of that can compete is the New York Pizza place in Jing’an Temple Plaza. Actually, this price hike might be a good thing for me. I used to like to have pizza and salad from Hello Pizza for lunch, but since the minimum order for delivery is 30 rmb, I would get two pizzas. 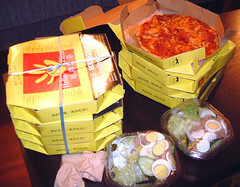 One pizza with a salad is enough of a lunch for me, but I would almost always end up completely devouring both pizzas. I think maybe I have some of those genes responsible for the tendency to eat a whole goddamn bag of chips. I think the new Tanghui is really cool, but it’s a totally different bar. I felt like it shouldn’t even be called Tanghui. The intimate dive I once knew is gone, and now there’s this fancy new four-floor bar. One thing that I was happy to see unchanged was the Tiger on tap for 30 rmb* a mug. I’m sure I’ll be back to Tanghui in the future, but I think I’ll continue meeting most of my live music needs at Shuffle. * Hey, that’s the cost of two pepperoni pizzas at Hello Pizza, even at the new prices. 1) You’re happy to pay 4USD for mug of Tiger on tap in a country with extreemly low living costs. 2) That “salad” seems to be mostly egg. The pizza sounds like a total bargain, though! Pizza here costs about 5 times that. 1) You clearly have never been to Shanghai. Fortunately that will be remedied soon. 2) The egg is just on top. What variety/genre/quality of bands play at the venues you mention? It took me about a week to realize the superiority of Hello Pizza. It’s not so bad at all, and it’s cheap. But, ironically, I too discovered this price hike just last night. I used the online menu, made the phone call, and alas…15rmb pepperoni. Had my first cheap Hello Pizza last night on Pan Yu lu – didn’t think much of it. For good pizza try Melrose Pizza – many locations – on on the south end of Hengshan Lu – small place. I’m more worried about your cholesterol than what the pizzas are doing to your wallet. The next time im in town we are getting some of this stuff. My treat. So be hungry. I love pizza too. Hello Pizza looks very tasty. Are you and SS serving this next year? Any suggestions for day tours when My parents come to Shanghai next year? For answers to those questions, see ShanghaiStreets.net and GigShanghai.com. No way, Melrose is a ripoff. It’s barely better than Hello Pizza, and it’s easily two or three times the price. Totally not worth it. You’re the one living in the States… I’d be more worried about my own diet if I were you. 🙂 I don’t eat pizza all that often… usually less than once a week. John and I discovered the price hike, too. Those 10rmb ones were quite popular. They used to attract us a lot. A few times just around 5:30pm they’d already be sold out. I remember that in front of the door of the restaurant, there was a big ad said that only 10rmb, you can get a 9′ pizza! It was their strategy to get customers. It worked very well. You would think that they should keep doing it. But they did not. Now they don’ t have any specical point to say. Though in general they are still cheap, but you get what you pay for.